This week's Cold Start, serverless is about delivering business value. Catch up on our travel and how we spread that message. We're finally off the road for a bit but we've learned so much. 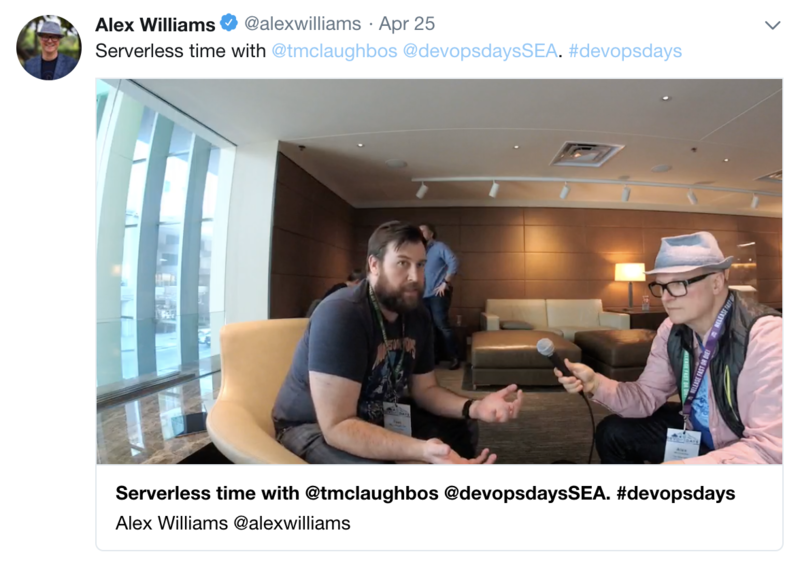 Catch up on DevOpsDays Seattle, how we've begun to communicate serverless, and the serverless news and happenings we've found. 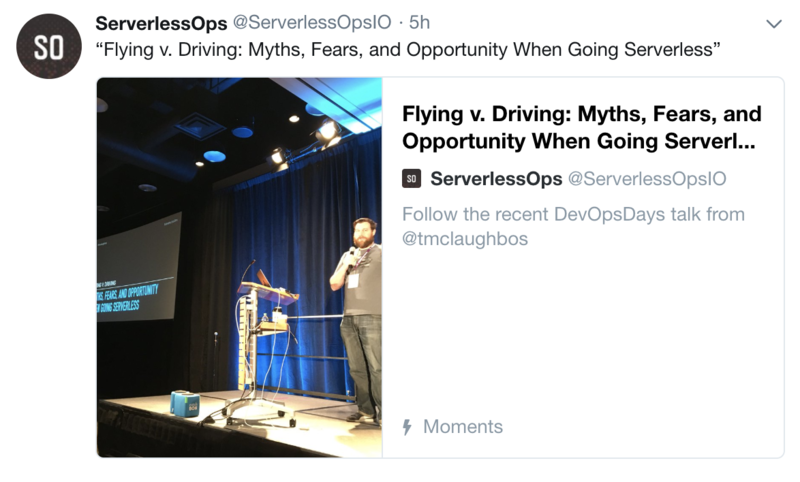 This past week we were speaking at DevOpsDays Seattle and delivered our talk "Flying v. Driving: Myths, Fears, and Opportunity When Going Serverless" to a great reception. We had several people approach us to talk during the conference and they were drawn towards the message of being able to deliver more value. We're eagerly awaiting video from the conference because we think it's a fantastic talk. In the meantime, click below and catch up with the live tweeting during the talk. Something we've struck on as we chatted with engineers the past two weeks was surprising to us. The talk we gave in Denver and Seattle is focused less on the tech of serverless and more on the oppurtunity for value delivery it provides. We emphasize a chance to solve new problems by relieving your responsibility for old ones. We emphasize being able to focus on problems closer to the customer. We emphasize delivering more business value. That message resonates! This was a little unexpected. But, we saw the nods of agreement in both the Denver and Seattle audiences. More and more engineers are becoming more sophisticated and savvy to understanding business value and they will listen. This shouldn't really be surprising though. DevOps is about people, process, and tools. Our tools are there to improve people and process. Many engineers are starting to see technology not as an ends but as a means to improving their organization and their day to day role. And increasingly with mantras such as "9s don't matter if users are unhappy" we're starting to see engineers care more about the user. The less we focus on the bottom of the tech stack the more we can focus towards the top of the tech stack and at the top is the user. Engineering audiences are getting this. You'll start to see us advocating this line of thinking more. By the way, we also touched on some of these themes while chatting with Alex Williams of The New Stack. Click below to have a listen. Check out our links below. We'll also have some thoughts on infrastructure as code and the recent Serverless Framework announcement about Components on our blog this week. We said we'd have this post out last week and we're sorry. We scrapped the blog post so we could form some better thoughts in light of the recent development. As always, remember to give us a thumbs up or thumbs down using the links at the end of this email. The folks at Dashbird deliver business metrics gathered from their customers on how serverless allows them to perform better. We need to be focusing less on technology as a cost, and more on it as a business enabler. When we do that these numbers make an even more compelling case to serverless. From Yan Cui, 10 steps for starting with serverless in your organization. We're glad to see others coming up with the same approach we believe in for starting your serverless journey. You don't need to start big. Start small and move quickly. When you're done, decide if serverless is still right for you and make a decision to contnue. Also remember, ServerlessOps provides consulting services around AWS serverless. We're here to have you up and running fast with your first serverless application. We handle the details of development tooling and workflow to let your engineers focus on delivering value quickly. Before you spend months building a container management platform, talk to us and give serverless in AWS a run. While at DevOpsDays Seattle we observed an operations engineer and a member of the Launch Darkly team chatting about feature flags for AWS Lambda. That made us realize, what's something operations engineers should be doing when the server goes away?.. How about feature flags? How well do you know how to implement feature flags in an application? How would you use them to handle A/B testing performance related changes? What about testing a rearchitected backend service? This is infrastructure work that operations engineers should be comfortable with in the future. Another bit of work for operations in the future, API backend migration to AWS Lambda. We operations engineers need to become comfortable with this sort of work. We may find ourselves doing this work as we attempt to vet Lambda as a platform for our environment, or this may even be the style of work we expect from operations engineers during platform migrations. We're excited to watch Serverless Components grow and evolve. Until now cloud platform management tools have not been capable of the sophistication that was achievable at the host level with Puppet and Chef. We hope to see that gap close. How much time in operations do you spend chasing down unused EC2 instances or right sizing services? Most problems never go away in tech, they just look a little different. We're going to be chasing down old, unused, and forgotten Lambdas in the future. We love Marcia Villalba's YouTube videos. This past week she demonstrated using AWS Secrets Manager with Serverless Framework. Have a watch!